Welcome to our binge eating series. This is article #1 of 5 about this crippling and life-stealing condition. Here I will give you a definition of binge eating based on my personal experience. In the 2nd page we will look at ways to prevent a binge - AND in the 3rd page we'll discuss how to stop one after it has started. Pages 4 and 5 will focus on recovering after a binge and how the disciplines of juice fasting and/or water fasting can provide a way out. If you have struggled with obsessive/compulsive overeating (or you know someone who does), then you (probably) know FIRSTHAND how destructive this sickness is, and how it can literally turn an otherwise vibrant person into a prisoner of his (or her) mind and body. A human being caught in the downward-spiral of binge eating is, without a doubt, being assailed by a vicious mental and physical behemoth of utter destruction. While I am NOT a doctor, I write to you with assurance because I myself struggled with binge eating for many years. 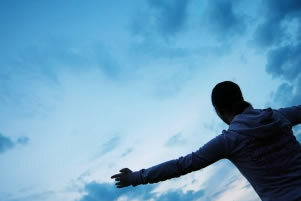 Having lost all hope and locked myself in a room to eat and commit suicide, the light of Providence shone down upon me from above and, in my darkest hour, led me to the amazing discipline of fasting. A 60-day water fast served as the platform for a dramatic process of physical, mental and spiritual detoxification which, against all hope, gave me the clarity and "cleanliness" that I needed to learn how to make better choices for myself. And so it is that, through this humble website, I endeavor to share about what I have experienced and learned in hopes that at least ONE person is spared the living hell that binge eating, toxicity and obesity caused me. I certainly do not presume to have the ONE-AND-ALL solution to this complex illness. There are many competent men and women of science and medicine who are much more suited than I to answer such questions as: "is there a cure to binge eating?" I can, however, talk to you about the ESCAPE HATCH that I have found thorugh fasting and full assumption of PERSONAL RESPONSIBILITY. Join we through the tunnel, if you will, and let's move forward until we reach the ocean, the sun, the stars ... freedom! Based on my personal experience, binge eating is primarily an ADDICTION to food. It is an invisible monster that lives in The Mind and uses life's "real and/or imagined" adversities to produce emotions and belief systems (ways of seeing & reacting to the world) which lead the sufferer to overeat in search of an ellusive COMFORT that - unfortunately - never comes. That is pretty much the way I describe the trap that I found myself in. Binge eating, I would say, is the MEDICATION a food-addict uses to NUMB the crushing emotional pain caused by daily existence. It is the HIDEAWAY where nothing exteral can touch or harm the sufferer. But while the intent of binge eating is to protect and shield the sufferer from pain, its inequivocal results are obesity, self-hatred, isolation and - eventually - chronic ilness. Food, once the protector and soother of all pain, turns around and becomes an unsurmountable foe bent on stealing the sufferer's life - ONE BITE AT A TIME. 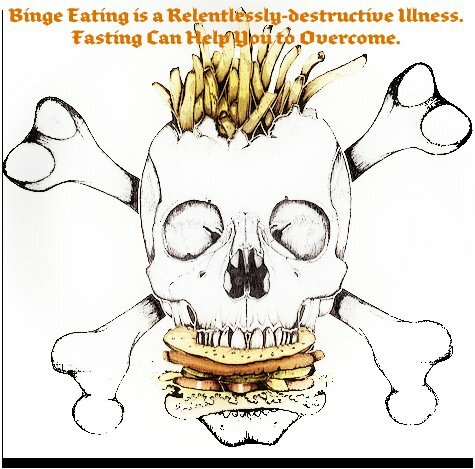 But binge eating does not ALWAYS have to be fueled ONLY by emotional pain. I meet obese people regularly who say they ALSO find themselves binging out of boredom or TO CELEBRATE a "SPECIAL" occassion. The premise is that, since there is nothing else (or better) to do, the person ends up niblling and grazing constantly to cover up a sense of apathy and the feeling that life is passing them by. I have seen this type of "binger" countless times, and most of then end up creating a life of ever-increasing sloth, gluttony and inactivity to justify their BOREDOM and therefore the overeating. "Life is dull and pointless", they tell me. "All I have is food". So while the "REASON" for binging in this case is boredom - not emotion pain "per-se" - the physical and mental trap is one and the same, in my opinion and personal experience. For many food addicts, EVERY situation - no matter how mundane - is reason enough to celebrate (and therefore binge). This FESTIVE EATING phenomena is strongly reinforced in our Western Culture where nearly every engagement is "celebrated" with a smorgasborg of high-fat finger foods and pastries. One curious recent trend is where many businesses hosting seminars, trainings and other functions fill the room with donuts, bagels and a plethora of enriched pastries. A friend of mine recently traveled to Europe on business and recalls a few foreign colleagues laughing at this US custom. According to these individuals, gorging on high-fat, sugar-filled foods during a business meeting is absurd. "Business is time for business - not eating", my friend was told. So binge eating is also a cultural phenomena. The dynamics of of binge eating, in my opinion, are basic and easy to recognize. This ENEMY WITHIN is comprised of two things: a mental OBESSION with food and eating, AND a physical COMPULSION that forces the binger to continue stuffing him or herself no matter the pain, misery and destruction. 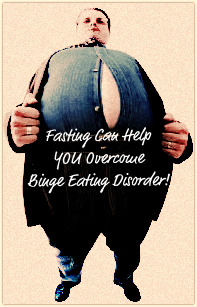 The first leg of binge eating is: "OBSESSIVE THINKING. An obsession, as you probably know, is typically an ongoing preocupation with something that one wishes to do or attain. Thinking about a particular past or future event and relentlessly finding ways and means to experience it NOW. These people generally do not feel at peace. They are filled with restlesness and irritability until the desired situation (in this case eating) is acted out. This obsessive cycle is a mental trap that makes the sufferer live in LIMBO because the past and future only exist in our minds. With the binge eater, the obsession manifests itself in neverending thoughts about food. Many of us find ourselves CONSTANTLY entertaining thoughts such as: "When is it time to eat? What am I going to eat? Where am I going to go to eat? I want to eat __ (a particular food). I should not eat that .... well, maybe just one bite. I should not eat that! Just this once, Why did I eat that? Ah! You are such a Loser!" And on and on. If you can recognize this type of thinking in yourself, then it is possible that you may be a food addict. Keep reading. The other symptom of binge eating disorder, I have found, is the inability to stop gorging once I take that first bite of the food that I have been obsessing about. So the obsession's primary objective is to get me to take the FIRST BITE. Once the toxic food enters the mouth, the compulsion takes over and the sufferer is overcome by the ACTIVE PART of the binge eating sickness. Can you look back and see this DUAL (obession/compulsion) dynamic operating in your life? *Isolate to eat: One friend, who has since passed, was so trapped by the sickness that he often would hide in the closet just to eat a twelve-pack of donuts undisturbed. In my case, it was common for me to go to the pizza parlor, order a large pepperoni pizza, and eat it ALL while driving back home. I would then fold the empty box and stuff it under the driver's seat. *Cry and Eat: If the day went badly, it is common for a person with binge eating disorder to sit in front of the TV with a gallon of ice cream of bag of cookies (or any other junk food) and just sob. One lady I grew up with would always purchase massive amounts of cookies and icea cream and eat them all while telling me f "how cruel and unreasonable her boss was". *Lie About Eating: A binge eater will often lie to his or her loved ones about what he or she ate to keep from being chastised. One man I knew would leave work and go to the neighborhood bakery and stuff himself with milk and pastries. Then he would go home and tell his wife he had not eaten. The payoff? He got to eat some more AND he did NOT have to explain himself or tell anyone that he had just gorged. *Get Up In the AM to Eat: It is common for a sufferer to sit up WIDE AWAKE in the middle of the night with uncontrollable and blinding hunger. My precious grandfather, God bless his soul, would get up each night at around 4AM to eat massive amounts of bread with butter. I was maybe ten years old and remember peeking under the door of my room to see grandpa and our (obese) Cocker Spaniel eat, eat and eat. Every ten seconds the toaster would spit out another two slices of bread. *Addicted to Food "Drive-Thru and/or Home Delivery: A person with binging disorder can often be trapped by the immediate gratification of ordering food, or having it brought directly home. "All I have to do is make a phone call and a pizza is brought to my front door. Ain't life grand?" Today it's even easier since many places allow customers to order online. So, day after day, - rather than shopping wisely and cooking healthy meals - many sufferers order take out/delivery ad infinitum - often overextending their budgets and "always" doing themselves grave physical and mental damage, These are but SOME examples. I could write an entire text with more. While some of these behaviors I have described may sound extreme, such is the case with some of us. The emotional pain that succumbing to them causes is beyond words. So whether it is done to cover up emotional pain, out of boredom, or to celebrate a special occassion (or for any other reason! ), the end result is always the same - OVEREATING. The sun is up? Let's eat! It is raining? Let's eat! The business came off well? Let's eat! The business came off bad? Let's eat! And so this cycle continues ad nauseum. 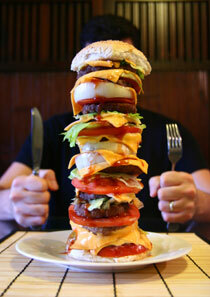 No matter what happens in life: good, bad or indifferent, the answer is to eat in excess. Once this binge eating malady has matured itself in the sufferer's mind, he or she is caught by a crippling behemoth from which it is very difficult to escape singlehandedly. Understanding how the binge eating tendency operates IN MY OWN MIND is part of the solution. One cannot change until one first admits there is a problem. Even MORE important - at least to me - one cannot solve the bingeing problem without understanding IT and being aware of its subterfuges and how it manifests itself through my mind and emotions. It ALWAYS comes down to personal responsibility. Being willing to do whatever it takes to overcome the problem. It matters little if the solution requires sacrifice and discomfort, we MUST become willing to advance! Is not our life worth that much? Let's continue to Binge Eating Help and look specifically at ways to prevent a binge. Return from Bingeing Part 1 to Fitness Through Fasting HOME. Say Hello ... Chat, Hang out!